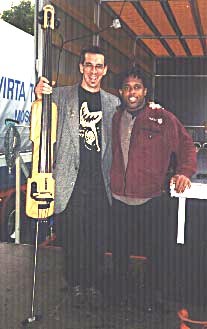 Me & Orlando Cachaito Lopez, bassist w. Buena Vista Social Club. There've been 2 times I wish I'd kept up my adult ed. Spanish classes: hangin' backstage w. Sr. Lopez & tryin' to talk to my gardner about the sprinkler system. "The L.A. Band" gets 'em dancin' in Pori. They threw a bunch of us together & gave us that moniker. Next year, we wanna call ourselves "The Fabulous Vellacott Sisters." (That's another story.) Personnel: David Arnay-p; me-b; M.B.Gordy-d; Ralph Dudley-v; & Ed White-g. Promoter Bill Platt & Restauranteur Rone (pronounced "Ronny") toast the end of another festival, Monday mornin', 5am. Champagne in waxed Pepsi cups. Bill's the guy whom I met @ Borders & brought us over. Rone fed us like royalty. Dig that "tattoo" on his upper arm. Rule No. 1 when traveling: ALWAYS carry a Sharpie. The Azola BugBass, me & Victor Wooten. Victor was of course playin' with Bela Fleck & was of course brilliant. View from the Main Stage during my set. Sari Moilanen belts out Janis Joplin @ the post-party, backed up by me & that very same guy on drums. Small world, eh? Sari worked as a liason for the festival; she took the guys in Big Bad Voodoo Daddy fishing. I think I'll add that to my rider next year. 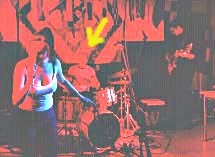 Click here for more groovy gigs from Ritt's sordid past... er, I mean illustrious career.